Looking to get rid of those annoying spam emails? Spam emails are more than annoying; they can cause viruses, malware attacks, and don’t forget time wasted reviewing and deleting them! Wouldn’t it be great if there was something to help get rid of them altogether? Now there is with ‘off-site’ spam filters! 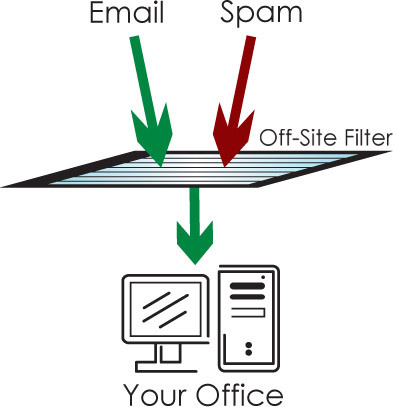 Off-site filters take care of spam before they ever reach your office, eliminating the risk and time that comes with them. ﻿﻿ Off-site spam filters are a cloud solution, meaning that they are on a server outside of your office. Before an email gets to you, it goes through the filter, where it goes through several checkpoints to determine whether or not it is spam. These “checkpoints” are updated several thousand times per day (yes, thousands) to keep up with those pesky spammers. Once an email is determined not to be spam, it gets sent to your inbox. The great thing is, all of this happens in just seconds and if the filter does come in contact with spam, you’ll never see it, protecting your office and saving you time. There are lots of benefits to having an off-site spam filter, but the biggest one is the fact that the spam emails are eliminated before they get to your inbox. The biggest benefit of course is the fact that the spam emails are eliminated before they get to your inbox. This saves space, processing power, and eliminates a lot of virus threats. With on-site spam filters your network is still being exposed to every spam email. They may go into a junk or spam filter, but they are still on your network taking up space and still have to be filtered as spam. A second reason off-site spam filters are better than on-site filters is the update frequency. Spammers are changing their tactics constantly and the only way to protect yourself is to stay on top it just as often. While on-site filters are updated about once a day, off-site filters are updated thousands! It would be a full time job to update your on-site filter as much as an off-site filter gets updated automatically. An added bonus to off-site spam filters is the store and forward feature they provide. If you lose power at your location or need to move your office, a big problem is losing important emails that come in during that time. With off-site filters, this isn’t a problem. If you lose power or switch locations, your emails are automatically stored for you for 24 hours so you don’t lose a single email. At ACF, we offer comprehensive email solutions including, of course, off-site spam filtering. If you have any questions about how spam can affect your business or what an off-site spam filer can do for you please contact our IT experts today at 813-235-6357 option 1. Have you heard of or experienced any issues due to spam? We would love to hear the story, let us know in the comment section below.